We headed to Bali today, so we got up early again for breakfast and then booked a Grab taxi the short distance to the railway station, to get the train back to Surabaya. This train was busy for the whole 2-hour journey, and we got off at the station before Surabaya called Sidoarjo, as it looked closer and we hoped less traffic heading towards to airport. As it turned out, it was probably just as bad, and about 1 hour later we arrived. 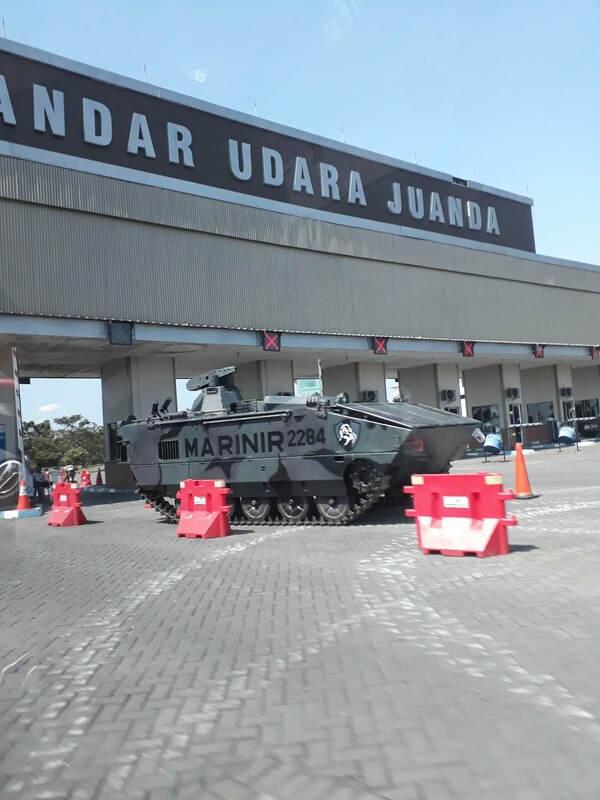 The Grab driver got a ticket on entering the airport drop off area (just passed a tank guarding the entrance), and then proceeded to tell me whilst pointing to the ticket that I would have to pay the 50k IDR for it, to drop us off at the terminal. Fortunately, I had already read about this scam, and on translating the writing on the ticket that he laid down on the passenger seat, I confirmed that the amount shown is the actual fine the driver would get if he lost the ticket, and the entry is free to drop off customers. So, after he dropped us off, and asked for the money from me, a few swift words were exchanged where I called him a scammer and told him he would be getting a 1-star rating on Grab, which they ask for feedback on, he swiftly drove off knowing he had been rumbled! Surabaya airport isn’t the biggest or best airport, with its minimal facilities, but we did manage to find a coffee shop to grab a quick drink and a pastry before our flight. Then we discovered our flight had been delayed by an hour, so after the usual sitting about, we found a smoking area. Sadie managed to get given some free tobacco off a guy from Lebanon who had a carrier bag full of it, who clearly by his rolling skills and openly admitted to rolling spliffs mostly, so was probably a good idea she didn’t like it and dumped it later… who knows what might have been in it! We eventually got boarded and took off on the short 1-hour flight to Denpasar, Bali. Also as the time zone changes, this meant we now arrived around 5pm, just at the worst possible time to get through the hectic traffic towards Sanur, our end destination. When we landed and got the airport bus to the terminal, we were both amazed on how fancy it looked as an airport, when getting off the bus you walked through a lovely garden area with temple like structures and all landscaped beautifully, not like any other airport I’ve seen before! I’d also read online about the so called ‘taxi mafia’ that operate at the airport, and again how they do not want Grab etc anywhere near the arrivals hall. 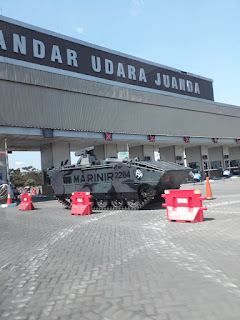 As we had arrived at the domestic terminal, we walked the couple of hundred yards to the departure hall, and it didn’t take long before we got a Bluebird taxi who had just dropped off, and they always use the meter so we knew roughly what to expect to pay. Driving through the roads from the airport towards Sanur, which is approx. 10 miles, we noticed so many amazing buildings, temples everywhere and kites flying high in the sky. Apparently, there is a huge kite festival next month, so it may well be people getting the practice in. 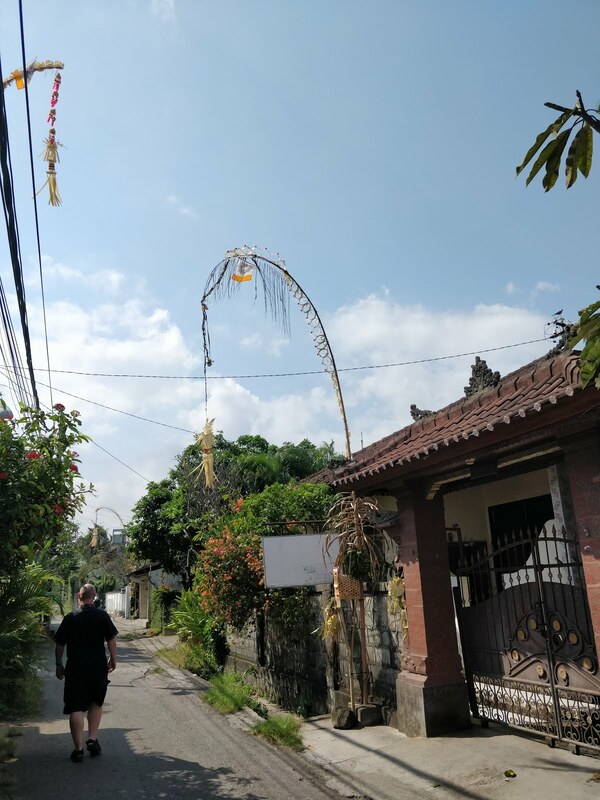 We also noticed a lot of houses had large upright bamboo poles outside, which bent over in an arch at the top, with lots of hanging things on them. We later learned that this was for offerings and a big Hindu tradition and there would be processions etc over the next few days. Anyway, the taxi took just over an hour, so it was dark as we arrived at Agus Villa, which was set on a little back street in the centre of town. 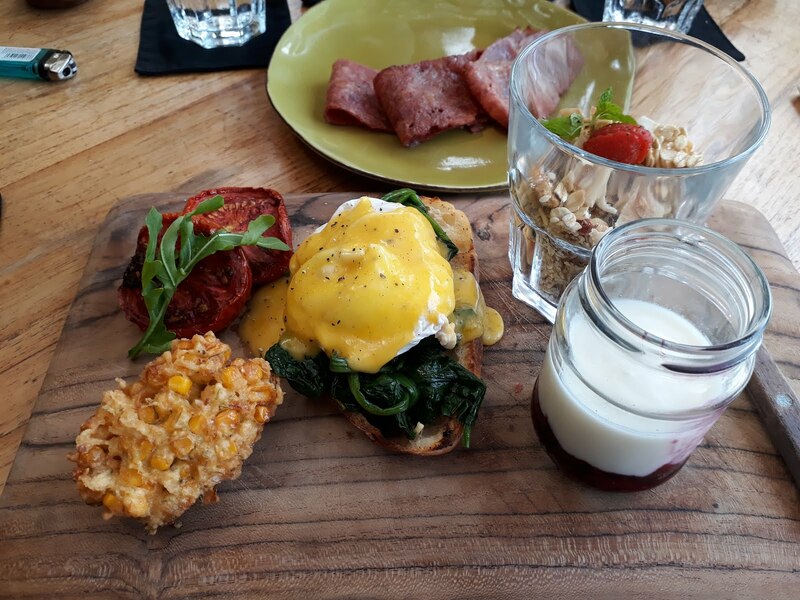 We had booked this place through AirBnb and paid around £12 a night Inc. breakfast, and though the pictures looked nice online, you never know what you are getting till you get there. Our host Dhyana greeted us and gave us the option of 2 rooms that were next to each other, and after a quick inspection, we took the one that had a huge number of cupboards and drawers that lined one complete wall of the massive room. This place was lovely, with only 4 rooms available, and I don’t think they were even all full over the whole week we had there. Just outside the rooms was a small pool, and a kitchen/seating area where we would get our breakfasts, plus we were also allowed to use the fridge, kettle, hob etc which was great. This was exactly what we wanted and needed after a hectic week or so previously, 7 days of just chilling out around the pool, wandering the streets of Sanur and having a bit of down time. And as it turned out, that’s exactly what happened! We went out for dinner after a long day travelling, and a 10-minute walk took us onto Jl. Danau Tamblingan, which is the main strip in Sanur hosting most of the restaurants, bars, shops and massage parlours. This place had a very Mediterranean feel to it, and again everyone is so friendly and welcoming. We had only walked about 5 minutes and came across a board outside a place called Rib Warung Steak, who were offering a Pork Belly dish and apple pie dessert for 85K IDR (£4.50). After that, we had a couple of beers and then retired to bed. Our breakfast was basic here, either fried or scrambled egg with toast, coffee, juice and a selection of fresh fruits, and it was lovely and filling, but did get a bit repetitive over the 7 days so we ate out a couple of mornings instead. We then went off to explore a bit of Sanur, taking in the relaxing atmosphere of the town and spoke to a few tour agents about possible trips out. One we did fancy doing was going to a place called Manta Point, however costs were expensive and we didn’t bother in the end. 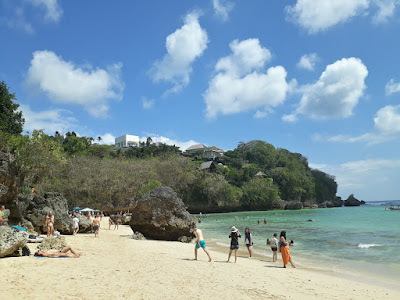 We also went down to the beach, and whilst it’s not the best for swimming in with a lot of seaweed, it was nice to walk along, watch the fishermen stand out all day in the shallow water and grab a nice cold drink from one of the many Warungs there. Just near our accommodation is a department store called Hardy’s, so we went and got some supplies and then just went back to chill and swim in the pool. 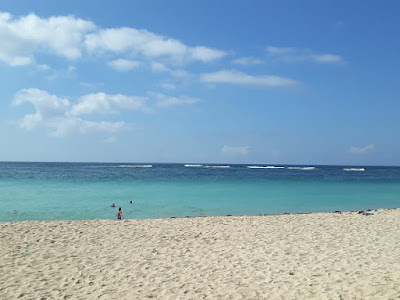 The reason we had picked Sanur instead of the more popular and rowdier Kuta/Legian areas was that an old friend of mine called Kelly, who I went to primary/high school with, was a regular visitor there as she now lived in Perth, Australia. She had recommended it, and as it turned out, was also visiting there the same time as us (we did plan that part to be there around same time), and that evening we had arranged to meet up at one of the venues called Casablanca for drinks. So off we went to meet up, and it had been I’d guess over 30 years since seen each other, but when we met it felt very comfortable and we sat and chatted for ages. 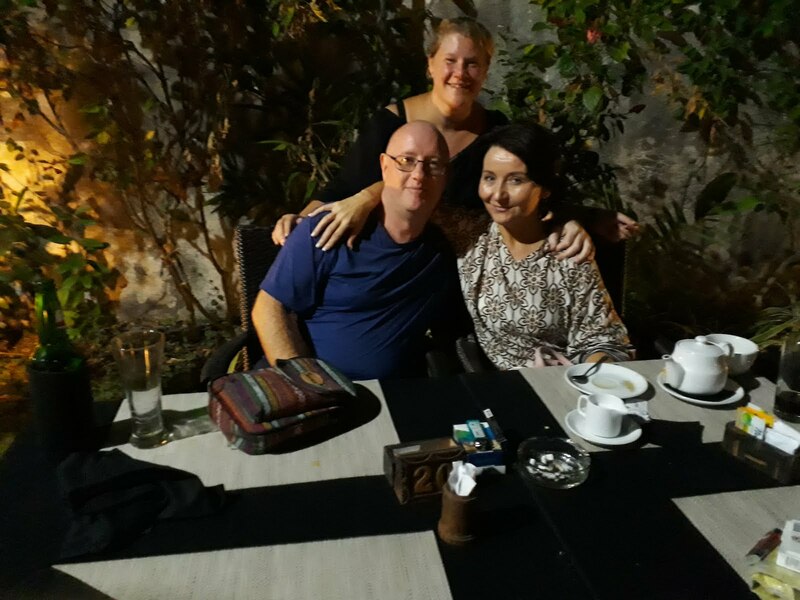 We then went just along the road for an amazing dinner, before returning to catch the live band and meet up with some of Kelly’s friends. 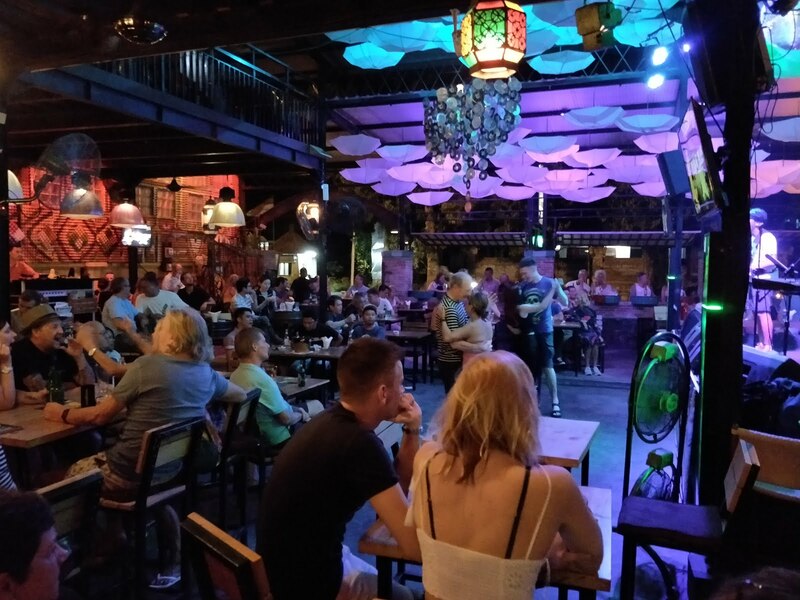 Casablancas is a large venue that hosts live music 7 nights a week, sold cheap beer and had a good atmosphere with friendly staff. With it being a Friday night, the place was packed but we managed to get a table with two of Kelly’s friends called Hannah and Simon plus a few other people. The band was called Aboe & Friends and they were an Indie Rock & Blues band who played a load of covers, one was Another Brick by Pink Floyd, where they had this amazing drummer playing along to their own version of it… it was impressive and the band were great all night. After many mugs of beer, and feeling a bit tipsy, we said our goodbyes and agreed to all meet up again there on the Sunday night for a Beatles tribute act who were also meant to be amazing. It was a brilliant night, good company, old and new friends, live music, beer, amazing food and to me anyway it felt like being on a proper holiday and not on a travelling adventure. Needless to say, the next day was a bit of a write off, with us not getting out of bed till midday and not leaving the room till about 5pm. 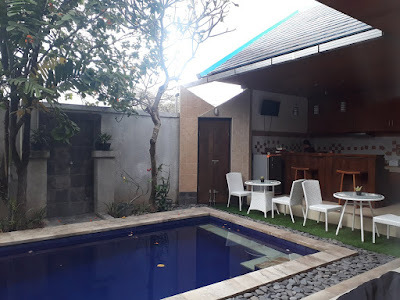 We did a bit of admin and research on what we were doing after leaving Sanur, and decided on booking 4 nights in Ubud. With only a quick outing for a walk up the other direction of the main road, we found a nice place for dinner where we had some Beef Kebab and Roast Duck, yep nice traditional Indonesian food! The next morning was another lazy morning, chilling out round the pool chatting to other guests and our host, and doing more research. We wanted to do Flores after Bali, so we looked a fair bit into that and booked flights to take us to Maumere, which is quite far east on the island, so we could then work our way back west along the island by road. That would be quite a road trip, and then with wanting to go to Lombok for the Gili Islands, then come back to Bali to do the north of the island if we had time, the logistics were proving difficult. So we gave up for a bit on that and went out for dinner, this time to a place called Little Bird which comes highly recommended. I had wanted to try Gado-Gado since coming to Indonesia, and this was that time. Sadie ordered her staple Nasi Goreng (Fried Rice), and both meals were delicious. Then we headed back to Casablancas to meet the others, they already had a table and we sat again with Kelly, Hannah and Simon plus a lot of others too. Again, it was a fantastic night in great company, the band The FaceBeat not quite as good as the previous one, but still entertaining playing mostly Beatles songs, and a few covers near the end. After they finished, and I’d had enough beer again (I was pretty much on first name terms with the barman), we headed back to bed. No surprises for guessing we had yet another lazy morning and even skipped breakfast, well we did plan to spend this week relaxing and not rushing round trying to see everything like some tourists/travellers do. But I did get given the telephone number of a good driver from a friend, so I had arranged for him to collect us the following day to take us out. However, as we had now booked our trip to Flores, Sadie was starting to panic a little as there is a medium risk of Malaria on that island, and as we didn’t buy any before leaving the UK, we went on a mission to try and get some that afternoon. But first it was food time, and we walked to a place called Soul in A Bowl, where we had the most amazing brunch, if a little pricier than the usual we pay for food. After asking in one of the Guardian pharmacy stores for anti-malarial tablets, we were told we needed a prescription to get them. Now we had already asked about them in several other stores on Java etc and at no point did we get advised that, but this woman insisted and sent us off to a doctors/pharmacy around the corner. On arriving there, the girl asked the doctor if we needed a prescription, who said no but sadly they didn’t have any in stock. But instead of walking back to the Guardian to try arguing our case, we just Googled another couple of places and off we went. The next place we got to had them in stock, and we got 100 Doxycycline tablets for less than £5, it would have been a lot more expensive getting them in the UK. We also picked up some Vitamin B Complex which is apparently good to repel the mosquitos with, and some more anti-itch cream in case we do get bitten. 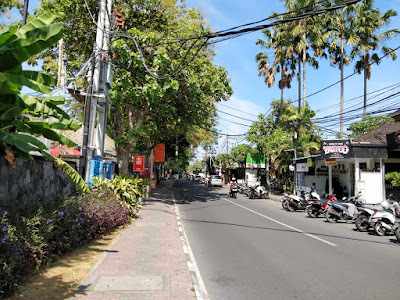 Sanur is made up of about 3 main streets that run parallel to the beach, and then smaller ones that interlink these and join up with other random small lanes. It’s a really nice place to walk round, with lots of little shops, Warungs and laundries dotted about. We had walked a fair bit during the day, so that evening we decided to eat at one of the little Warungs, just around the corner from our place. So, the following morning, we had arranged for our driver Putu to pick us up at 9am and we had a rough itinerary in mind as discussed with him over WhatsApp. 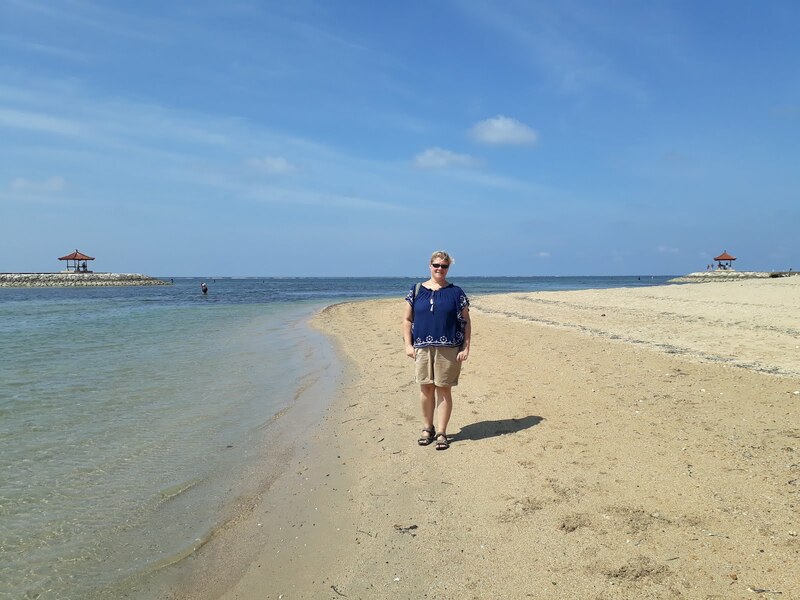 Our first destination was to a beach called Nusa Dua, which is on the peninsula south of the island. 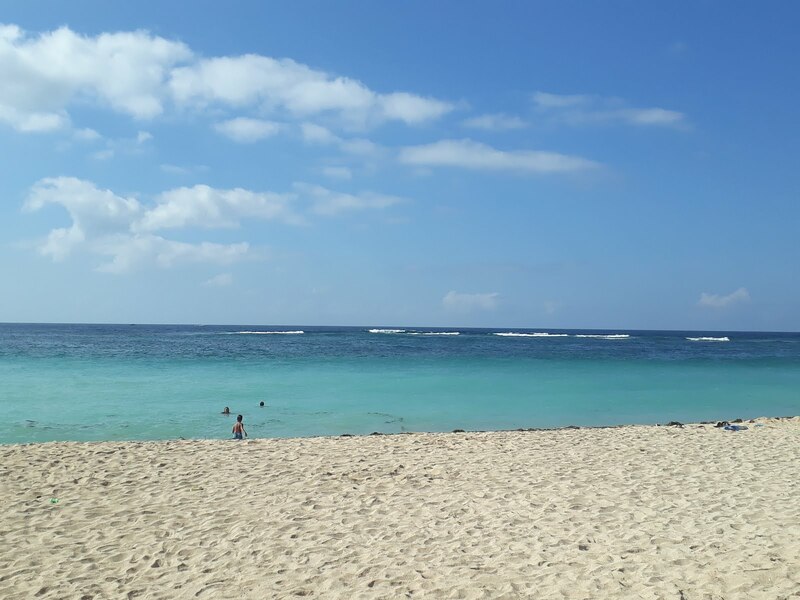 It was a lovely golden sandy beach with fairly clear water and wasn’t too busy, but sadly not much good for snorkelling although we did have a swim for a bit then chilled out. After an hour or so, we headed along the coast a bit to another beach called Padang Padang. This one you need to pay 10,000 IDR (50p) and on the staircase down along some rocks, there are cheeky macaque monkeys who steal your possessions if given half a chance. The beach was small with lots of lovely rocky areas, with lots of Chinese tourists taking those ‘Instagrammable’ photos again, we had another swim and then got back up the stairs to get changed, and the monkeys were playing with each other in a fountain which was quite amusing. By now it was lunchtime, so on our way to the next destination of Uluwata Temple, we stopped at a roadside Warung for some food. We ordered some food and a cocktail each (Pina Colada and a Mojito), and 10 minutes later the waiter came back to us to say I couldn’t have what I ordered as they had run out of mint, so I changed mine to a caipirinha. Another 5 minutes passed, then he came back to say would I like it with vodka or rum!? Anyway, we got our cocktails another 10 minutes later, the Pina Colada just tasted like mushed up pineapple and mine whilst had alcohol in it, wasn’t very nice. The food eventually arrived about 40 minutes after first ordering it, so we quickly ate and then got back in the car. 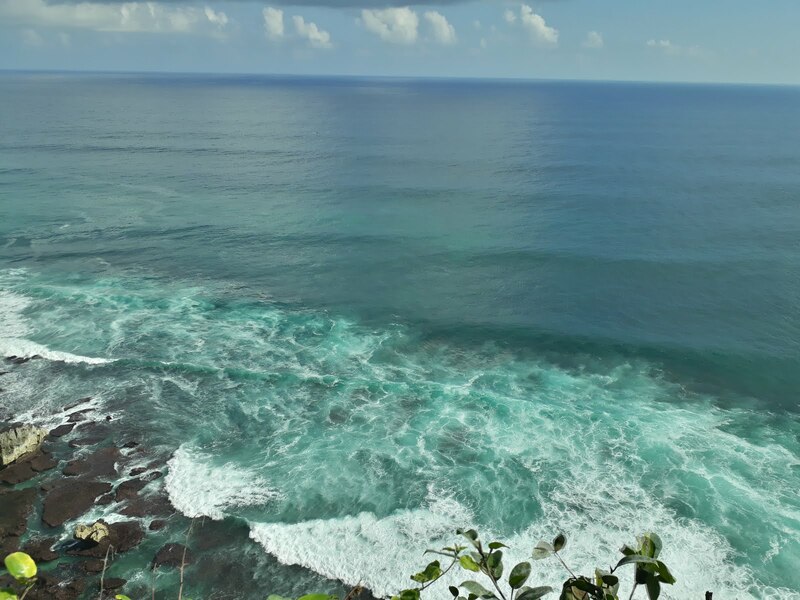 The short distance to Uluwata was lovely, passing through lots of small villages, with a heavy influence in surf shops, as this part of the coast is one of the best spots in Bali to go surfing. We arrived at the car park for the temple, and Putu warned us about the monkeys here can be pretty fierce and will steal anything off you that isn’t attached. I had also read this, and so left my glasses and hat off and off we went to pay our 30,000 IDR each to enter the temple area. They make you wear a sarong if you are showing any leg at all here, although the way some people were dressed, it doesn’t seem to be enforced. The woman who gave me my sarong asked if I wanted her to come with us, to ‘protect’ us from the monkeys, which I politely declined. I had read that they are prone to stealing phones, bags, sandals etc, and will happily return them on bartering them with fruit… cheeky buggers! Anyway, we managed to get down to the cliffs without incident, although we did see one run off with a sandal, swiftly chased by a couple of the rangers to retrieve it. The views when we got to the coast were stunning, a sheer drop down and a small beach area with huge waves crashing down, we could see why this was surfing territory. The actual temple was a bit of a disappointment, you can’t even actually enter it and to be fair we had seen far more impressive ones even by the side of the roads. 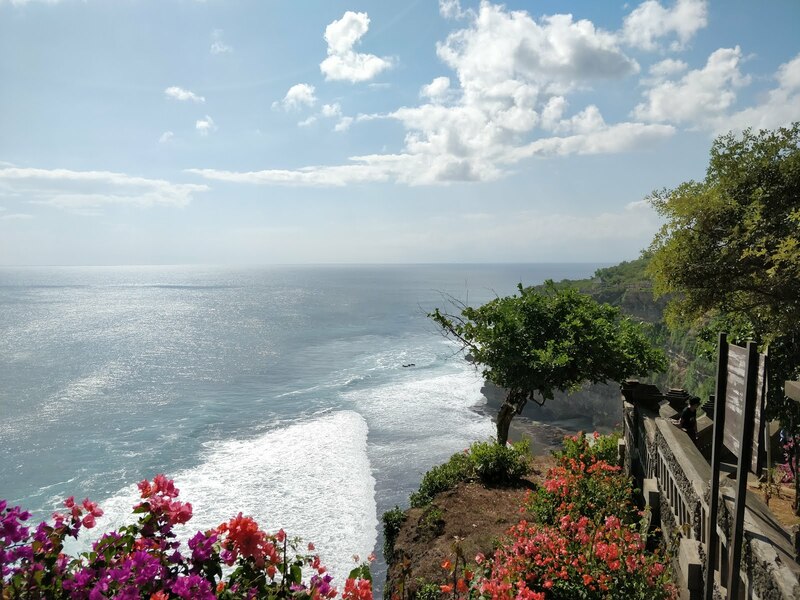 We didn’t hang around long, as we needed to get back to the car to head on the long journey up the coast towards Tanah Lot. Although it wasn’t a great distance away, we had to fight the traffic in the busy tourist areas of Kutu, Legian and Seminyak so the journey took us around 90 minutes. 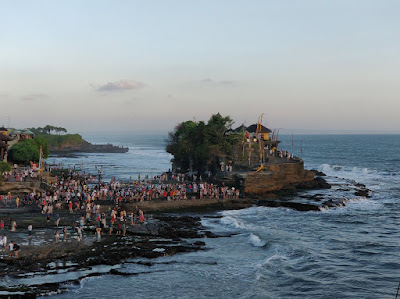 Tanah Lot is a little village next to the coast, which is famous for a couple of temples and its sunsets. You are required to pay 60,000 IDR (£3) to enter the ‘village’ which seems a bit excessive, but we paid and then got parked up. Again, the views were stunning, with the 2 temples on the coastline. The main one is Tanah Lot, which is on a small rock formation that can only be reached when the tide is out. We decided not to venture down there, and instead take up position on the cliffs between both temples to get a good view of what we came here for, the sunset. The place was full of tourists, but we found a nice bit overlooking the bay, which again had amazing waves and beautiful clear water. The other temple, Pura Batu Bolong sits on the cliffs which have a limestone arch below which reminded us of Durdle Door in Dorset. 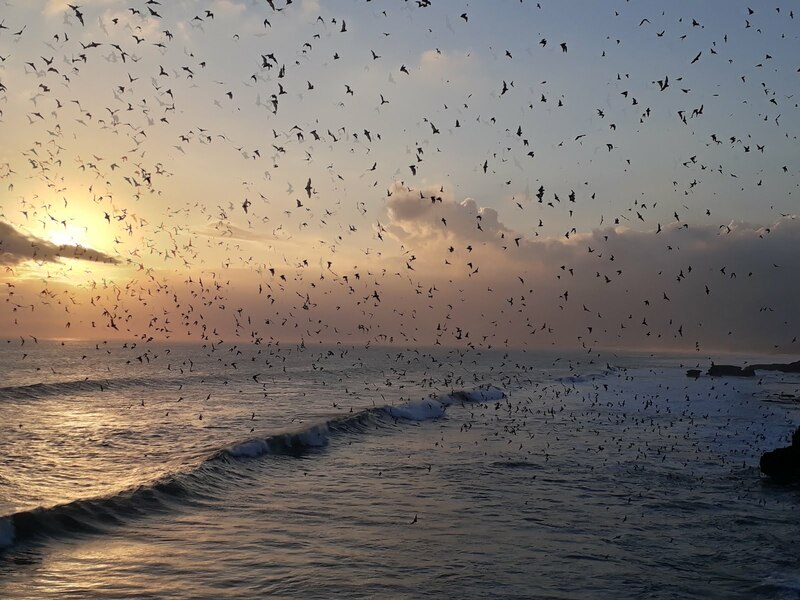 Just as the sun was going down, we had the pleasure of seeing thousands of bats appear from the cliffs below us and fly off into the distance, like what we seen in Myanmar. Sadly, a huge cloud appeared in front of the sun just before she set, which although didn’t give us the perfect sunset, still made it pretty to watch with the reflections on the water and in the clouds. 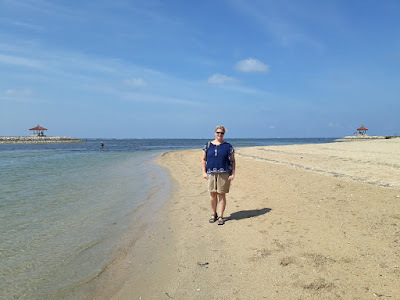 And that was the end of our day trip out, it was good to see a bit of the coastline that makes this island so famous, but we had to head back to Sanur via horrid traffic again, so didn’t get back till about 8pm. That evening we had arranged to meet Simon and Hannah again at Casablancas, Kelly had gone home the day before, so after having an amazing pizza from a small Warung, we had another good night watching another live band with them called Rachma & Friends, but this time with less mugs of beer! After saying our goodbyes to them, it was time for bed after a long and tiring day. Our last full day in Sanur was yet again another lazy morning (I could get used to this life) and we finally nailed down a route and approx. dates through Flores, onto Lombok and the Gili Islands before a return to explore the north of Bali. So, we booked our flight from Denpasar back to Jakarta, which would see us leave Indonesia at that point.